ACFN is North America’s only ATM franchise providing services to hotels and other travel and entertainment based businesses. We have been providing ATM services since 1996, began offering ATM franchise opportunities in 2003, and we now have more than 260+ franchises that own and operate 2,500+ ATMs in the United States and Canada. Many of our franchisees say that the ability to start the business without interfering or interrupting current job was one of the main reasons they decided to join ACFN. Our business model can be scaled to fit an individual’s specific situation allowing owners to grow at the pace which suits them. 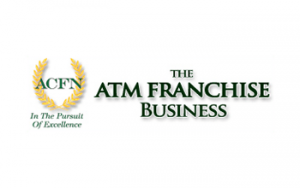 Franchisees join ACFN for different reasons and from various backgrounds. Some join us after retiring from a lengthy career, while others are fresh out of college and eager to make additional income. Many are looking to compliment their existing income and others are looking to replace their current income. Whichever situation brings you to ACFN, our proven business model will work for you. If you are looking for a part time franchise that can lead to financial independence with strong long-term residual income and without the complexity of employees or the demanding schedule of a retail operation, ACFN is the home-based franchise for you. Our franchise program has been recognized as one of the top franchise opportunities by many publications including the prestigious Entrepreneur Franchise 500, Inc. Magazine, Franchise Times, Military Times Best Franchises for Vets and AllBusiness.com. Proven track record: Benefit from our significant client base, which includes some of the largest hotels in the country, national parks, hospitals, museums, entertainment venues, sports bars, theaters and more. 1. National databases of business to conduct market research and identify businesses that meet the initial ATM placement criteria. We help develop and provide franchisees with a segmented list of these businesses in the agreed upon radius of operation. 2. Marketing materials to help interest prospective businesses in our ATM Program and to maximize the chances of securing a contract for ATM placement. Our team works to contact and contract locations for the placement of your ATMs. ​3. Lead tracking software, which enables you to view the activity of your leads. 4. Support for scheduling and completing ATM installations once an agreement is signed with additional support during installation to ensure correct programming. 5. Complete monitoring and service support after installation in addition to on-going performance monitoring of processing and accounting functions.